There has been a lot of discussion around a recently released photo of an F-22 with a shock wave visible around it as it passes overhead. This can be seen HERE. This reminded me of my own photo which I took almost a year ago at the Miramar Air Show. I did not have my 5D Mark II at the time so this photo is taken with an XTi. You can see the cone shape of the shock wave form as water-vapor condenses rapidly between the forward sound waves. 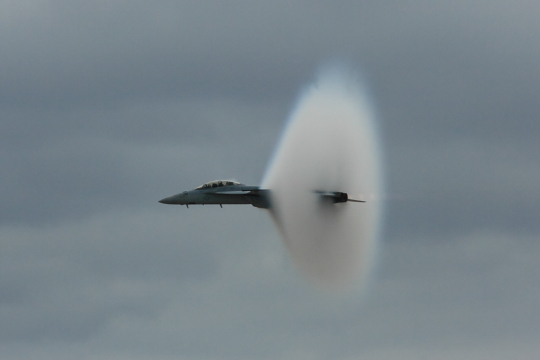 This F-18 did not break the sound barrier but it came close enough to produce this phenomenon. I like this photo because it captures something which only appears for an instant in time. As soon as it happens it is gone again. Photo Info: Taken with the Canon Rebel XTi at ISO 200, F 7.1 at 1/2500 of a second.